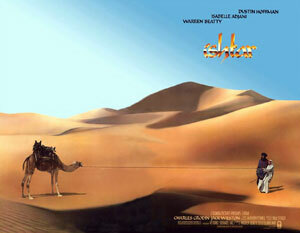 In the world of Hollywood movies, the name Ishtar is synonymous with flop. Ishtar, Elaine May’s 1987 version of a “Road to Morocco” type movie, stars Warren Beatty and Dustin Hoffman, and when it came out, it was an unmitigated flop, recouping only $14M of its $55M price tag. The press that preceded its release was so bad that, despite its star quality and Elaine May’s impressive credentials (A New Leaf, Heaven Can Wait, Reds, Tootsie), I never went to see it, never rented it, and never even considered buying it. Then, yesterday, I found this 27-year old movie available for streaming on Netflix. Curious, I queued it up.